In a large pot of boiling, salted water, cook the pasta until al dente. Drain pasta and keep warm. In a large pot, melt the butter over medium-low heat. Add the onion and season with salt and pepper; cookuntil softened, about 6 minutes. 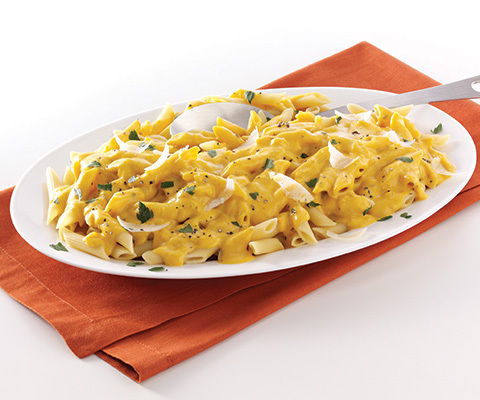 Stir in the pumpkin and Alfredo sauce. Add some water to get a desired consistency. Heat until all ingredients are heated through. Serve over warm pasta. Top with parmesan and parsley.